Gabrielle Dudgeon, SAB vice president of promotions, said that Social Media Week is a great opportunity for students to get involved and show their engagement through social media platforms. “We’re excited to provide a platform for students to learn how to better use their social media,” Dudgeon said. Ashley Campbell, SGA deputy chief of campus issues, said that the importance of how students portray their personal and professional identity online is constantly increasing. “Since the broad expansion of the Internet, the world around us has developed into an online communication path,” Campbell said. Social Media Week initiated from a program originated in Bridgewater State University. It was established at the University of Kentucky in spring 2012 by SGA. SAB collaborated in planning the second instalment of the tech-savvy week, which is hoped to become an annual event, Dudgeon said. “SAB is proud to join SGA in planning an event that is so relevant to the UK community,” Dudgeon said. Social Media Week events throughout the week intend to maintain its commitment to inform students on a variety of social media networking sites, professionalism and online safety. 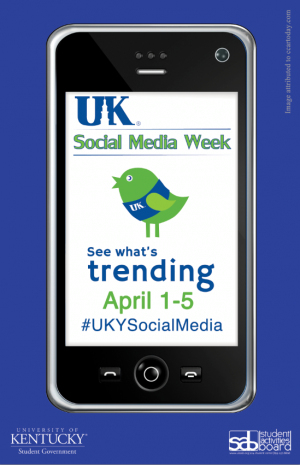 More information, including a full calendar of events, can be found by following Social Media Week on Twitter at twitter.com/UKYsocialmedia or liking it on Facebook at www.facebook.com/UKSocialMediaWeek. Questions about events should be emailed to contact@uksab.org or aoca222@gmail.com.